I hope you have enjoyed your weekend. I finished this book yesterday so am pleased to be able to share a quick review this evening. Far away, in a crowded camp, Saif is treating a little boy with a badly-cut hand. Saif is a refugee, but he's also a doctor: exactly what Mure needs. Saif is welcome in Mure, but can he forget his past? Over one summer, Saif will find a place to call home, and Lorna's life will change forever. This Quick Reads short story was published in February this year by Sphere. If you are regularly reader of this blog you will know that I'm a fan of the Quick Reads series released via the Reading Agency. You can find my review of Dead Simple also released this year here. 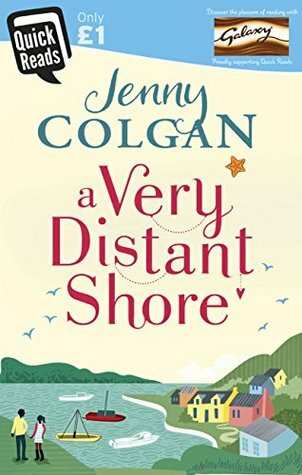 A Very Distant Shore is a romantic novel set on a remote Scottish island, here I have to be honest as soon as I found this out I had to read it. As a self-confessed Scotophile I actively seek out books set in Scotland and when I come across them by accident I'm delighted, so to find a Quick Reads book set in Scotland was a bonus. Until the two stories merge and Saif arrives on the island, each chapter flips between Saif a Syrian Refugee and Lorna a teacher on Mure but it is easy to follow the story and sets the book up nicely. The contrast between Saif's culture and the culture of the Island is a different as chalk and cheese. However, Saif is quickly accepted by the islanders and he and Lorna develop a great friendship. Saif struggles to come to terms with leaving behind his life, not knowing what has happened to his family and the stranger customs of the island. Meanwhile Lorna tries to cope with her father's illness and her busy everyday life. Whilst this is a complete story, at the end of the book Saif has not found his family, so it did leave me wanting to find out more but it didn't feel unfinished. The island of Mure is also the setting for one of Jenny's full novels, The Summer Seaside Kitchen, which was also released this year, and although it doesn't follow-on from this book it maybe that the characters are revisited. The Summer Seaside Kitchen will be on my list to read but I doubt it will be read this year as I can't say I'm a big fan of the author. I have read previous books from her but she gets mixed reviews from me so it's hit and miss. I didn't enjoy Working Wonders and, unusually for me, I didn't finish it either. On the other hand I read Christmas at the Cupcake Cafe which I completely loved. You can't please all of the people all of the time right!